Benjamin Moser has spent the last twelve years of his life immersed in the Brazilian author Clarice Lispector. He has written a biography of her, translated and edited her works, and most recently contributed to the The Complete Stories, translated by Katrina Dodson. 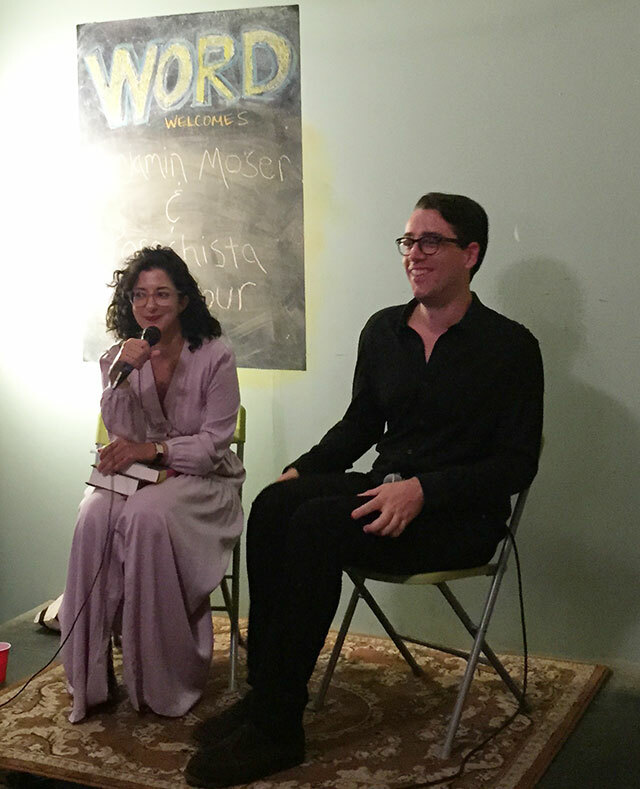 He was at WORD Bookstore in Brooklyn to discuss Lispector’s life and work along with the novelist Porochista Khakpour, at an event hosted by Vol 1 Brooklyn. Khakpour begins by explaining that she and Moser have not met before the evening, though they have been email correspondents for quite some time. She first came to read Lispector’s work ten years earlier having read The Smallest Woman in the World. She went onto have an obsessive journey seeking out Lispector’s work, eventually coming to Moser’s biography. Why This World: A Biography of Clarice Lispector was released in 2009 after Moser spent five years writing it. He explains that his own interest in Lispector began as a series of coincidences. After attending high school in Europe, his interests pivoted towards the east. He began learning Chinese. In college, his professor explained to him that it might take ten years of studying the language just to learn how to read a newspaper. “We all have other things to do,” he quips. Once more, Moser pivoted his interests turning back to Europe. He gave up on Chinese and took up studying Portuguese, a language he found much easier because of his background speaking French and Spanish. Also, Portuguese class was at 11:30 in the morning, making it easier to study. He learned both Brazilian and Portuguese, two dialects of the same language. However, he says the more one learns about the languages, the farther they get from their Latin cousins like French, Spanish, and Italian. At the time, most of the books novelists tackling South American political issues. “I’m socially aware, but I’m not that interested in it,” he says of those Brazilian books they had him reading. Then he found Lispector. “I still remember the moment I read the first page,” he says, adding that reading it felt like looking into his soul. Moser went to Brazil. He learned the language. He wrote a biography on Lispector. Then he moved away, headed to Amsterdam, working as a writer of sorts when he decided to read her work again. He was wondering if she was as good as he thought she was when he was a teenager. She was. She was better. Khakpour says that often translated work is ruined by a bad translation. Yet Lispector’s work, she explains, is beautifully and sensitively translated adding to the appeal. Moser could have done the translating himself. He has translated some detective novels that he describes as “cute.” However, Portuguese is under represented, Moser explains. There are not many people who translate literary Portuguese works. So with the Lispector’s works, the publisher, New Directions wanted younger Brazilian translators to help them and jumpstart an interest in translating Brazilian Portuguese works of literature. The collected stories contains all her works from when she was young right up through the last two story fragments that were on her desk when she died. Much of Lispector’s life was conventional, Khakpour observes, and that is surprising. Lispector was very much a diplomat’s wife, and wanted to be good at that. Lispector was a stunningly beautiful woman of Jewish and Ukrainian descent. Her family left Europe for Brazil after her mother had been raped and infected with syphilis. At the time, pregnancy was believed a cure for the disease, and so her mother became impregnated with her in the hopes of curing the disease. Her beauty mattered. Moser describes her appearance as majestic, although her high cheekbones were likely a product of the syphilis her mother endured while she was in utero. It becomes a challenge though to talk about a woman’s appearance. Lispector was beautiful, but she was also a genius. Beauty though, like wealth, always impacts a person’s life, even if it is in ways that are unseen. Lispector did not like being alone. She missed her family in Brazil when she lived abroad with her husband. She often called friends in the middle of the night to talk because she was lonely. They answered the phone though, because she brought energy and life to any conversation, even at four in the morning. “Its a book of life,” Moser says, about the collection. Khakpour adds that she believes Lispector was really in touch with the strangeness of not just being a woman, but with the strangeness of being a human. Lispector is also the first female author to describe in her writing the full facet of life as a woman, from girlhood, to motherhood, to aging. Its common to see this kind of full spectrum look at femininity today, but was the first. She had to invent how to describe all of this, Moser explains. Her womanhood was not something that necessarily benefitted Lispector though. “Being a woman is something people are going to hold against you no matter what you do,” Moser says. Lispector always claimed that she would write after her death, Moser says. And that is what happened with the invention of Twitter and Facebook. People begun quoting her on these mediums. Some of the quotes were not actually her. One place Lispector has never published though is The New Yorker. The New Yorker turned down the opportunity to publish her stories. Moser says they sent the magazine editors the collection of stories offering to let them excerpt from it, but they declined.